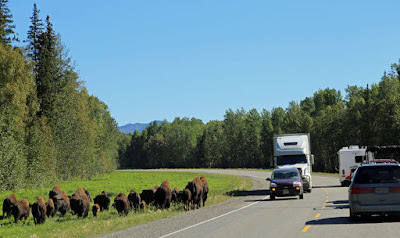 usbackroads™: usbackroads--Section by Section Review of the Alaska Highway from Dawson Creek to Whitehorse. Welcome. We are exploring the public lands and backroads. Find the best campsites, hiking and bicycling trails, fishing and hunting areas, canoeing, birding, areas on your public lands. Come join us. 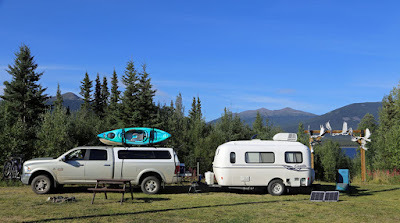 A community of travelers sharing our ideas, special places and exploring the best America has to offer; the back roads and small towns of this great country, far away from the urban chaos. All materials and photos copyrighted 2010-2016© and cannot be used without permission. mileage: 872 miles: 17 hours total driving time. Section One: Dawson Creek to Fort Nelson: 282 miles: 5 hours 30 minutes drive time. It is only 282 miles between but it feels much longer than that. Maybe because it was cloudy and cool all day with rain showers. 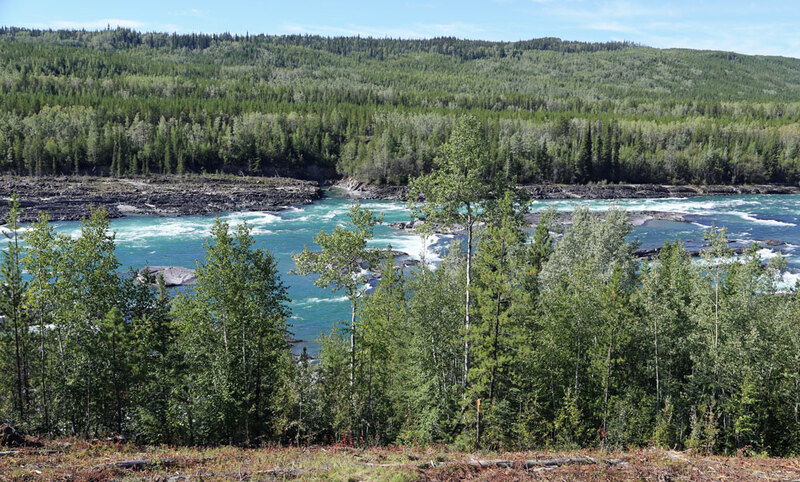 However, it probably was the fairly boring scenery and a landscape dotted with man camps and natural gas development projects. The first part of the trip goes through a fairly urban area for an hour or more. It is not until you head north of Charlie Lake that you clear the traffic. I was heading south on this portion of the highway. And drove only 280 miles since I took the cut-off for Prince George a couple of miles short of Dawson Creek. So I missed all the tourist stuff in Dawson Creek related to the Alaskan Highway. I would definitely stop there if your starting the trip there. My advice do not linger on this stretch of highway. Easily the least interesting and most boring part of the entire trip. 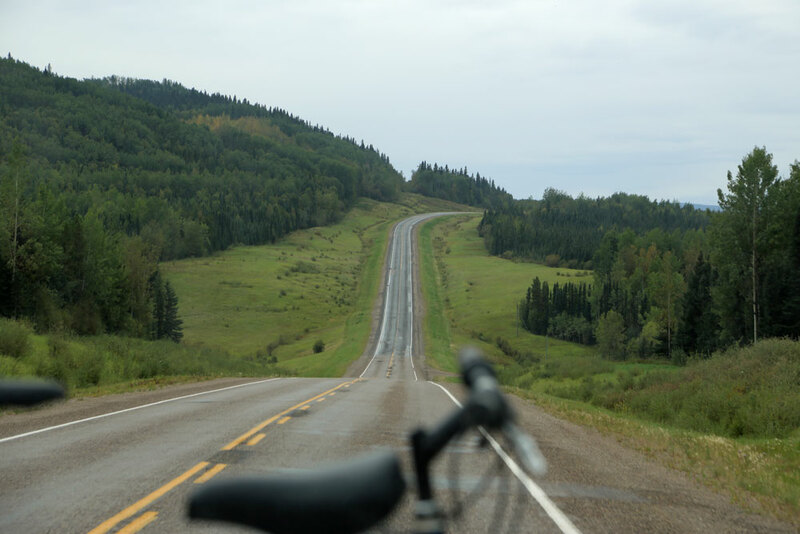 Section Two: Fort Nelson to Liard Hot Springs: 190 miles: 6 hours drive time. This stretch of road is pretty as it crosses the Rocky Mountains. I did remind me of the Canadian Rocky Mountain National Parks like Baniff, Jasper, and Yoho. Not quite as pretty, but there is definitely a familial resemblance. 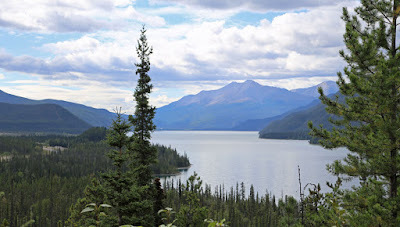 The initial stretch of road from Fort Nelson is pretty good and it climbs up to Summit Lake the highest point on the Alaska Highway. Summit Lake is definitely worth a stop even if it is right next to the highway. There is a campground and picnic area there. I had cell service with the amplifier. It is an exposed site. While I was there a front was blowing in making it windy and cold. However, in better weather it would be a great spot to camp and watch the evening colors as the sun sets and have a hot cup of coffee as the sun rises behind you. The highway drops into the McDonald Valley and the town of Toad River. Very pretty country. It makes you want to drive slow just to take in the scenery. There are plenty of spots to pull out and camp. Google Earth shows additional camping possibilities just off the highway. A interesting area to explore at slow speed. The road continues and reaches Muncho Lake. A large blue-green glacial lake with lodges and campgrounds. From there it is a fairly short drive to Liard Hot Springs. 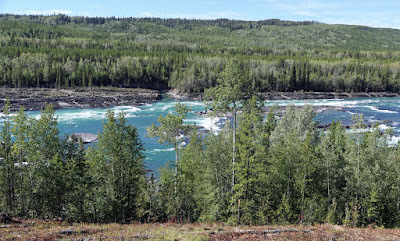 I spent three nights at the Provincial Park. Lots of interesting country to explore in the area from the park. Take your time on this stretch of road. It will be one of your favorite parts of the Alaska Highway. Section Three: Liard Hot Springs to Watson Lake: 129 miles: 4 hours drive time. The spectacular scenery of the previous section is gone, but this section starts feeling like the Alaska Highway. The scenery is nice, and you do get the feeling that you are far, far away from all the madness to the south of the highway. There was less traffic on this section than any other stretch of highway, but that might have been just the days I chose to travel this stretch. Watson Lake is definitely a tourist community and home to the "world famous sign forest". I thought it would be a ugly spot. A forest of signs. The town has done a great job managing this "organic" tourist attraction. It was fun looking for signs of very small towns in Idaho and Washington. The sign forest is worth the stop. Plan on at least a couple of hours to find those signs from places you have visited in your previous travels. Watson Lake is also in the Yukon. Which meant their Government Liquor Store had a different selection of wines than British Columbia. The only disappointment was that a good grocery store not to be found. Oh well, it is the Alaska Highway after all. 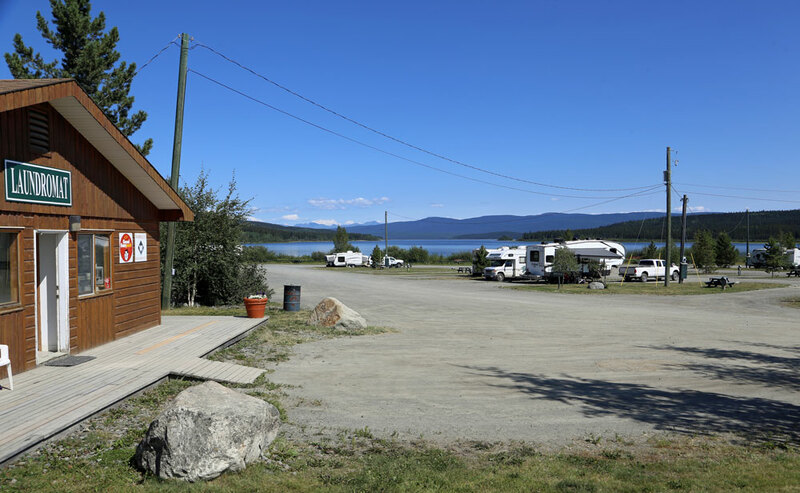 Section Four: Watson Lake to Whitehorse: 272 miles: 5 hours 30 minutes drive time. 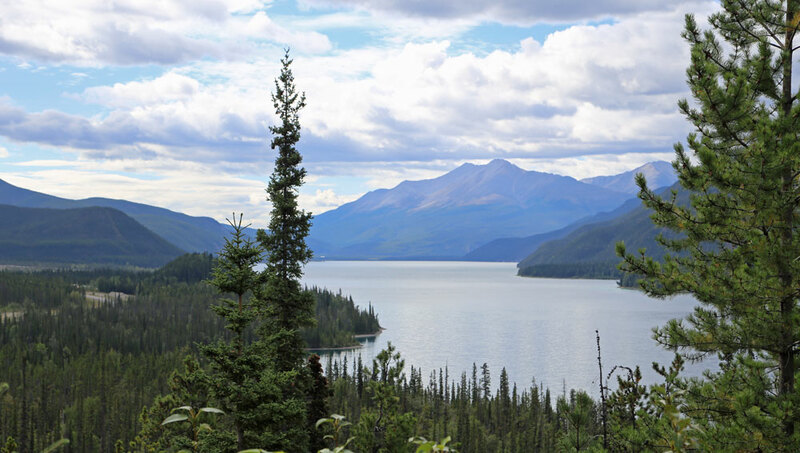 This stretch of road goes between the Yukon and British Columbia, but rest assured it is part of the North. An interesting stretch of road, with some attractions and spots to camp. I drove it twice both coming and going. This is one of those stretches of road with some interesting spots to stop. Fishing appears to be good in the area. It is also a good stretch of road to make time. I am a retired professional Forester exploring and writing about the public lands of the United States (www.usbackroads.blogspot.com) and our vacation rental cabin at Camas Meadows Natural Area Preserve, Washington (www.camasmeadowslodge.com).